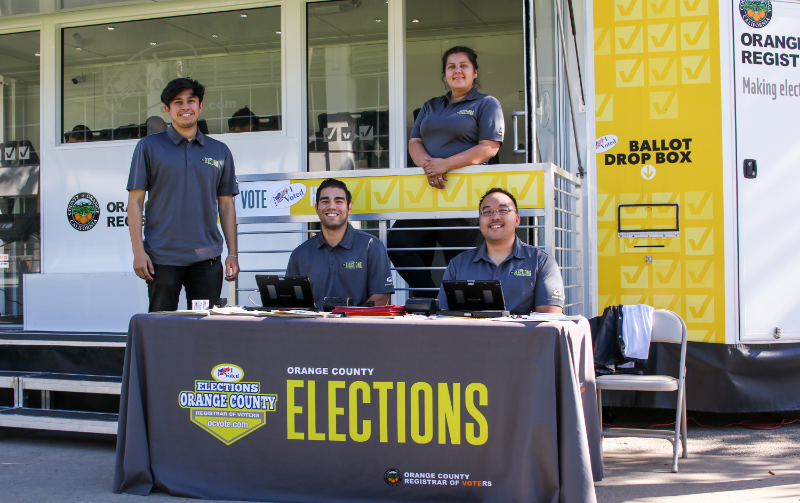 As we approach one of the most significant midterm elections in recent generations, Cal State Fullerton made voting even more convenient than ever for students, staff and faculty with a mobile booth for early voting on Nov. 1. A day after Halloween festivities, many Titans switched gears to civic participation on Thursday, Nov. 1, getting an early start to voting in the midterm elections by casting their ballots at the Pop-Up Vote Center on Tuffy Lawn. The mobile polling spot, which includes three private and secure booths with voting machines, was open from 7 a.m. to 8 p.m., one of a number of such locations sponsored by the Orange County Registrar of Voters to ensure that the busy residents of California’s third most populous county don’t miss the opportunity to let their voices be heard. While residents of the immediate campus vicinity can vote on Tuesday, Nov. 6, at the George G. Golleher Alumni House, the Pop-Up Vote Center, staffed by trained representatives, was the first time that Orange Countians could cast their ballots on campus regardless of their address. The center also accepted completed absentee ballots. The new options for on-campus voting are part of an initiative by CSUF President Fram Virjee and his wife, Julie, to encourage the campus community to engage in this month’s elections, which include races for governor, U.S. Senate, U.S. House of Representations, the state legislature, ballot measures, and local and school board positions. While voter turnout tends to decline when the nation’s chief executive isn’t on the ballot, with younger citizens often the first to shun the polls in midterm and off years, President Virjee and other Cal State officials encourage eligible students, faculty and staff of all political affiliations and viewpoints to participate, recognizing the significance of every elected position and every election cycle in the broader American experience. The initiative is part of broader efforts to get out the vote this year, in which early voting alone is already outpacing the total turnout for the last midterm elections in 2014 in some places. Are you encouraging your friends to cast their ballots? Use hashtag #TitansTurnOut when using social media to share about voting opportunities and initiatives at CSUF. For more information on Cal State Fullerton efforts, contact the office of Government and Community Relations at 657-278-7295 or online. To verify your registration, register, or learn about races and candidates in your hometown, visit the Orange County Registrar of Voters online. Are you a commuter residing in a nearby county? Visit the websites of the Los Angeles County Registrar-Recorder, the San Bernardino County Elections Office of the Registrar of Voters, or the County of Riverside Registrar of Voters for information specific to your area.